God has many problems to work out trying to watch over the humans he created. People are not mindful of the Ten Commandments and often seem to break them purposely as if spitting in the face of God. Humans feel let down by God and disappointed in his ability to fulfill the role of a father figure. Many people have had no earthly father figure making it even more difficult to think of God as a father when he has no physical presence in their life. I find this to be a problem of God in that he has a responsibility, at minimum, to find a way to show humans that he is there for them in life and not like so many earthly fathers who have only contributed the sperm needed to create a child. “I don’t believe in God, and how could anyone believe in him? If this is, as we are told, our heavenly father, then he seems a rather absent one. Why doesn’t he notice at all the piss poor state of the world? [He] can’t exist or he’s a poor excuse for a father.” –Jack (YahooAnswers np) Jack doesn’t pull any punches in asking his pointed question about God being our heavenly father yet is seemly absent in so many people’s lives. Jack is not just upset with God but also with himself. In his question I pulled from Yahoo Answers, Jack goes on to share that he has a daughter he only saw once, shortly after her birth, and never again thereafter. Jack acknowledges that he is an absent father himself and is unable to make the connection of God as a father in his own life. Jack, like many others, questions why God has allowed the world to “fall to ruin” if he is such a “caring father” to humankind. “How can I call God “Father” when I do not know what a father is? I have tried so hard to understand my friends when they talk highly of their fathers. I am angry with him for leaving our family” (Balthazar 543). The writer of this statement is not alone in his thoughts. According to The Centre for Social Justice Report, lone parent families are increasing by more than 20,000 a year and have been steadily rising over the past 40 years. The report estimates there are more than 3 million children growing up predominantly with their mothers (Richardson np). The teachings of Jesus and from the Bible are that God is our heavenly father but how can a child ever relate to this concept if their earthly father is nowhere to be found? Even those who do have both parents present in the household may have difficulties with this concept, especially if they have never engaged in biblical study through a pastoral figure, church or Sunday school. Even with such guidance, understanding an unknown figure that cannot be seen or spoken to as a father would still be difficult. Is this the problem of humans or the problem of God? If God’s goal is to have us accept him as our heavenly father than I would lean towards this being God’s problem. Certainly a difficult one as family’s fall apart daily making finding a solution or creating a solution is nearly impossible, even for God. People, even those that are the best Christians possible, fail miserably every day, yet God somehow expects parents to be role models for their children. 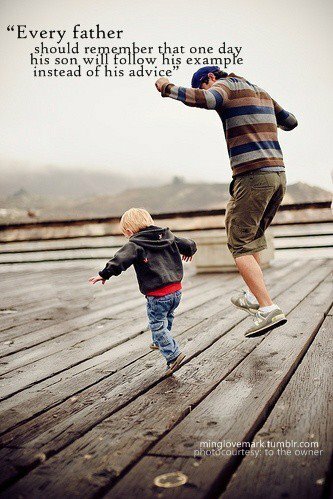 A difficult task if a father is not present in the child’s life. In Gannett’s article, “The Parent. The Child-And God” he refers to the parent as a trustee. He then compares God to a parent as God watches every moment on the earth instructing the man and woman to “Hold him, keep him, tend him for me. He is my boy, she is my girl: tend them for me” (Gannett np). This article written in 1903 places the responsibility back on the parents to tend to their child and raise their child in a Godly manner. Unfortunately this dual parenting system has gone by the wayside. Gannett continues that God is fate to the child and God is not the absentee, but God is present, securing by the wonderful method of his parental love. I seriously have my doubts if the three million children who have an absent father look to God as his replacement. In a YouTube video, the concept of God as an absent father is addressed. The men in the video discuss how the neglect of their father’s led them to pray to God for support and answers, but they felt they never received answers. “God never says, ‘Good job’ as my father figure. There was never a tangible person and having the Holy Spirit inside was not enough.” After living 28 years and receiving no feedback from God the one man said it lead to suspicion in his life and questioning if there really was a heavenly father. He asked, as many people do, “Why does God let tragic things happen and do nothing?” He found this unacceptable to believe and a real problem of God. He believes there is not external force that will come in and take responsibility for the tragedies in people’s lives. He now believes we must accept what happens and realize the tragedies are not necessarily comic. “We must do what we can to avoid these evil things and prevent them. You must trust in your heart because the answers are not in the [biblical] text.” After years of struggling with the neglect of his father and the difficulties in accepting God as his replacement father, he came to a decision. This man pushed the Bible away from himself and told God the Bible was not good enough to take the place of his absence (DeSkepticon np). He broke away from both his earthly neglectful father and the heavenly father that he never quite felt was present. The video the two men made discussed their feelings towards God as a father figure. Years had been invested in giving God a chance to “step-up” and prove he is worthy of this title. It may be said that this is a twisted concept of how we are to accept God’s love. We are to not question how God works and instead have faith that how our life unfolds is his ultimate plan for us. Psycho-spiritual analysis suggests that inadequate involvement of fathers can bring anger that impairs people’s understanding of how God can be “Our Father” (Balthazar 544) If this is indeed factual, than what is God doing about this problem? Looking again at the article from 1903, it raises the importance of a “family alter” in the sanctuary home where the family bows their individual souls together at morning or at night. This is when the father and the mother and the two or three little ones live as one unit of blessedness, one household of love and has the feeling of family thankfulness and aspirations. The author states that this practice has fallen by the wayside in households placing the blame on the parents and removing the responsibility as a problem of God. He calls this the shame of the liberal faith for not lifting the souls in a household thanksgiving (Gannett np). Could this be the very downfall of a two parent family unit, the loss of giving thanks to God as a family within the household? Even if God is forced down the throat of a child daily, this will not necessarily guarantee a child will accept God as their heavenly father and be set on a course for eternal life. The lives of children and adults have changed so drastically since 1903 that the concept of a family, even one that attends a traditional church service on Sundays, also having a morning or evening gathering of thankfulness at home seems incredulous. I’m willing to bet nearly every household would state there just isn’t time in their schedule. The time once dedicated to worshipping God has been lost to careers, school, sports, television, the Internet or video games. Socializing in person or on the World Wide Web holds higher importance than praising God as a family unit and factor in the high number of single-parent homes and God is moved even lower to squeeze into the schedule. If more people are pushing the Bible away from themselves as DeSkepticon did, is there any hope for improvement for humankind through God as a heavenly father? If human-beings are moving away from God, then Slavoj Žižek concept in his video is not that difficult to believe. While Jesus was hanging on the cross as recorded in the Bible in Matthew 27:43, at about the ninth hour into his hanging, he knows he has reached the end of his earthly life and cries out, “My God, My God, why have you forsaken me?” Žižek claims this is the point in which Jesus realizes there is no God. He also states “Of course we cannot know what God wants from us, because there is no God” (Žižek np). This is the personal opinion of Žižek, but could it be true? God has a problem, not just that of absent fathers or being an absentee father himself, but that people have lost in their faith in him. What needs to happen for faith to be restored in humankind now that so much has ebbed away over time? An old-fashioned revival or maybe an old-fashion, vengeful act of God to get our attention that has strayed so far since biblical times? Couldn’t God just solve all his problems by sending Jesus back to earth and making those who don’t believe realize just how wrong they were? It is not God’s problem if we don’t believe in him, but our own and personally, if I find out in the long run that the Bible was a book of fiction and God was just human’s way of trying to keep people inline (which obviously would be a FAIL) I don’t see there was any harm in my beliefs. If there is no harm to this belief while living, and in death I find it all to be true, then the rewards for my belief in a heavenly father will be too numerous to write and I will in fact have held the faith regardless of God giving me proof while on earth that he is indeed above, watching over us all. Balthazar, Pierre M. “How Anger Toward Absentee Fathers May Make it Difficult to Call God ‘Father’” Pastoral Psychology. (2007) 55:543-549 Web accessed. 1 May 2014. DeSkepticon. “Is God an Absent Father?” Online video clip. YouTube. YouTube, 11 Mar. 2011. Web accessed. 7 May 2014. Gannett, William C. “The Parent. The Child-And God.” Friends’ Intelligencer. (1853-1910) 24 Oct. 1903. Web accessed. 8 May 2014. Richardson, Hannah. ‘A million children growing up without fathers.’ BBC.com. 9 June 2013. Web accessed. 9 May 2014. YahooAnswers. Society & Culture>Religion & Spirituality. “Isn’t God an ‘absent father?’” Answers.yahoo.com. 2007. Web accessed. 1 May 2014. Žižek,Slavo .The Pervert’s Guide to Ideology. Dir. Sophie Fiennes. Zeitgeist Films, 2013. Film.